Intensify the tissues of affection within you and your close one by presenting the person this Aromatic Affection Gerbera Assemblage and let sweetness of your bond be augmented. This Assemblage presents charming Gerberas of 12 Reddish Pink and White colour laid out in a nifty Glass Vase that is further embellished by a prim Bow-Shaped Yellow Ribbon. Send this Blooming Bounce Gerbera Collection to your love-mate on the anniversary of your first meeting and let the fervor of romance drench both of your hearts. 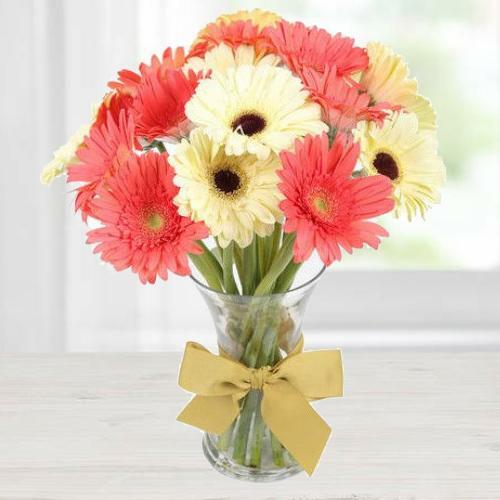 This Collection displays enchanting Gerberas of 18 White and Reddish Pink dyes sorted together in a chic Glass Vase that is enhanced by a trim Yellow Ribbon of Bow Shape.